In 2005 I designed the TH2 engine for fellow Salford alumnus and ex- work colleague Jon London to use in his excellent educational talks. 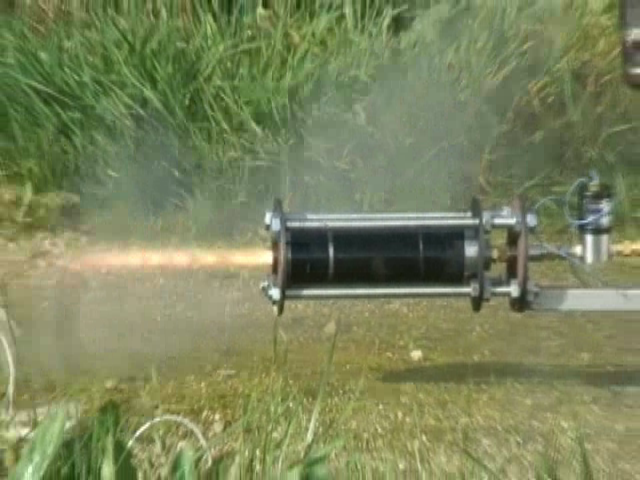 This is a demonstration engine that can burn a clear plastic rod, such that you can see the combustion occurring inside, or burn other novel fuels (Salami) inside a clear plastic tube. Such engines always make an impact with an audience and through a highly varied and unlikely route, Jon ended up discussing some kind of food fuel demo for Brainiac. For the uninitiated Brainiac is Sky TV's "wacky" science show, and true to form they expanded some what on the brief. 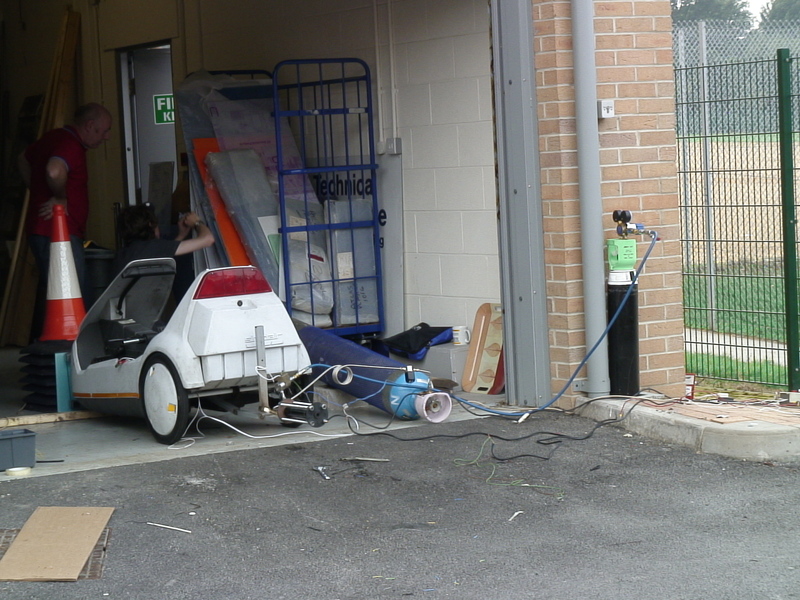 So in July 2006 Jon and I found ourselves agreeing to create a system that could compare the performance of differing fast foods as rocket fuels; prior to using the winning fuel to propel a Sinclair C5. The performance was to be gauged by running three rocket powered skate boards (unpiloted...) simultaneously. Fueled by Kebab meat, fish and chips and pizza! The C5 was created by Sir Clive Sinclair, an electronics and computing millionaire in 1982 in an attempt to revolutionise personal transport, think Segway, but less successful. They were a pedal/electric hybrid vehicle; single ratio pedals for slow speed manouvring and click on the single speed electric system to travel at 15mph. It was a valiant attempt but was excessively designed technologically, pushing up the price, and under-designed ergonomically (no weather protection, indicators, throttle, adjustable seat) pushing down its appeal. After becoming a definition (unfairly) of a technological joke, sales were abandoned less than a year after launch. Sir Clive continues to bring out gloriously impractical attempts at personal electric transport every few years and the C5 has become a cult classic. Interestingly when you describe the pitch of a C5 to a group of high school children, something I would do many times following this project, not only do they all want a go, but they all want one... maybe its time has finally come! In the interests of speed and convenience we opted for a modular design that would be kept the same across the skate boards and the C5. We also plumped for clamping a cylindrical metal combustion chamber between end plates, like the low pressure demo engines. This was so that we could easily change the length of the fuel block, and therefore adjust the mixture ratio if needed, which in the end, we didn't. In the interests of simplicity we chose Nitrous Oxide, familiar to many hybrid rocketeers, for the oxidiser. This is self pressurising and behaves much like CO2, it can be stored as a room temperature liquid at around 53 bar, meaning you only need one tank, no separate high pressure gas supply or pumping required. It also runs at a high mixture ratio, making for small fuel blocks. 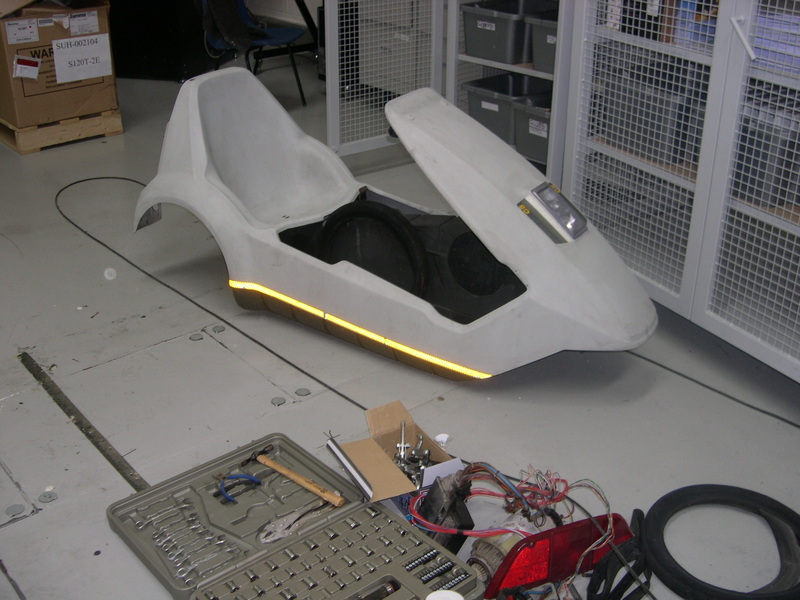 The engines were just bracketed on to the skate boards, but the C5 has a plastic body (apparently the biggest injection moulded piece ever at the time, maybe still) sat on a small metal chassis. 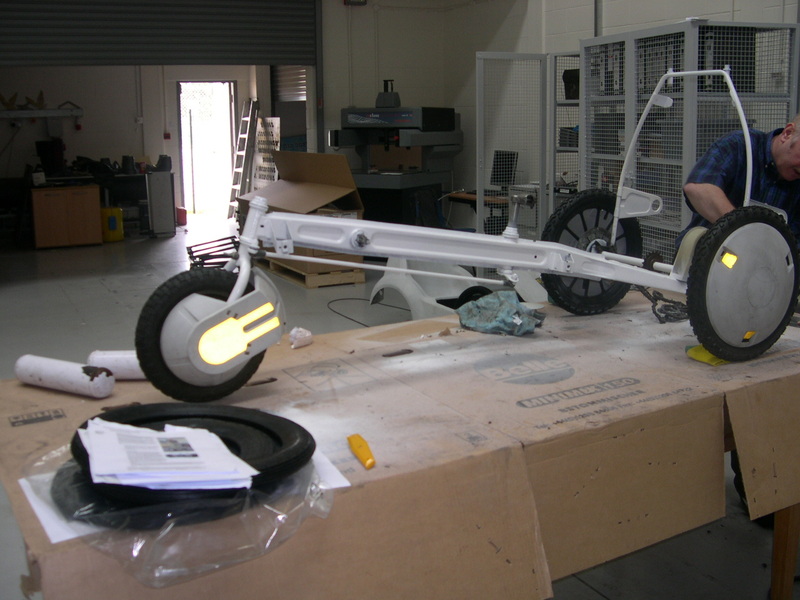 This necessitated an extension spar fitting to the chassis under the body, that protruded out of the back of the vehicle to mount the engine on. Almost all machining and fabrication was handled by Bolton engineer Roy Haslam, without Roy it would not have been possible to accomplish the project at all! He turned, milled and welded all the new bits together, while the C5 was stripped (it had lived outside for many of its 24 years) and the fuels were tinkered with. For the oxidiser system we used existing CO2 cylinders for the nitrous, controlled by a remotely operated manual ball valve on the skate boards. On the C5 this was accompanied by a non-return valve and a nitrous solenoid valve supplied by a very helpful company in Devon I can no longer recall or refind! When finally everything was together we tried the first tests. All my previous engines had used an oxygen preheat and I had hoped we might be able to get round this and light the engine with a trickle of nitrous. 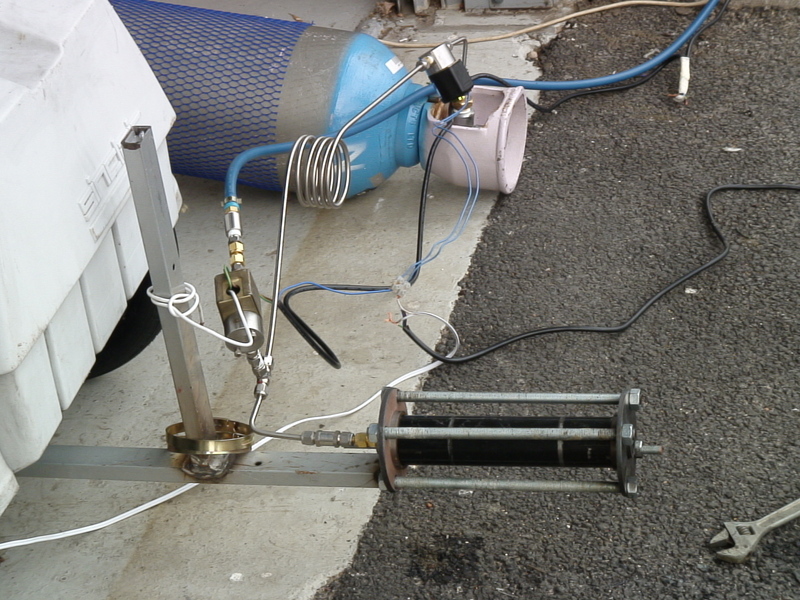 Unfortunately the nitrous proved just too cold and too fast for the igniter and after afrustrating afternoon we returned to oxygen preheat. With the preheat everything started perfectly; initially we tested the engine bolted to the restrained C5 and a ground supply of nitrous. We started with the predictable perspex fuel, in this case formed from laser cut discs, cut from scrap acrylic, then moved on to the food fuels. The various foods were blended, compressed into spare engine cases and frozen to bind them together. Meat worked fine, we knew this had been done before for science demos, though I think Mythbusters had been the first to try (relatively unsuccessfully) to derive useful thrust from food rocket fuel. Pizza lived up to our expectations of doing absolutely nothing, though it does extruded itself out of the rocket nozzle in an interesting way if you let it defrost in there.... The big surprise was fish and chips, maybe it's the carbohydrates, or the cooking oil but it performed better the meat or perspex, and even showed restart capability! Finally we had the skate boards working, full required duration from the C5 and everything was working reliably. So we found ourselves heading down to Surrey and by chance the Top Gear airfield. We set-up early with the Casino Royal 747, whose Bond sequences were also filmed at the airfield, in the background. The skate boards were to run across the width of the runway on three guide wires. The producers perhaps finally appreciated the power of the system when the unconstrained skate board we showed them in the morning managed to back flip into the grass. There was then a mad rush to source tougher guide wires from B&Q Guildford before the filming was scheduled to start. Everything was in place when the crew and presenters arrived from filming elsewhere in the morning. All were very intrigued by the project and presenters Vic Reeves and Jon Tickle both came over pleasingly well. We prepared the skate boards while the crew did all the explanatory segments and mock-up fuel production for the cameras. We really did use liquid nitrogen to fast freeze the food fuel though. Unfortunately the ball valves were stating to struggle with the low temperatures caused by the nitrous fill and by the time we lit up most of the nitrous had gone and the skate boards lurched forward but didn't run. The presenters filmed an immediate reaction to this non-event just in case, and we hurriedly reset everything. Next time everything was ready and waiting for the fill and the boards lit up properly; the fish and chips streaking across the runway and kicking up the wire when it ran into the stop; the kebab followed up reasonably quickly but not as vigorously and the pizza just issued forth its unused nitrous. Fish and chips was the perfect surreal result for the programme and it was onto the C5. 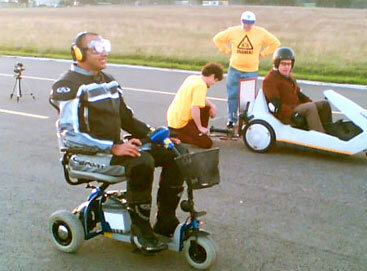 The idea was a 40 metre drag race against a vehicle Brainiac considered equivalent to the original electric C5, a mobility scooter. Vic Reeves was to drive the C5, in tweed, and Jon Tickle the scooter, in motorcycle leathers. Everything was in place, the first one lit but again the nitrous ran low and Vic finished the last 5 metres or so with the pedals. Again it was all filmed so it could be used and again we reset. The second attempt went perfectly, which was just as well as we had about 20 minutes usable daylight left. Watching the sequence from the side on view (I was following up behind at the time making sure the engine was behaving), the scooter zooms ahead to start but quickly reaches top speed while the C5 continues to accelerate while the engine burns. Slowly over taking the scooter and winning the drag race! At no time did Vic have to resort to the pedals, though it was an awful lot closer than they make it look. Vic's pretty tall and therefore rather heavier than the test drivers, and I didn't pump the tires up hard enough, so the performance is less than during the tests but it really worked! 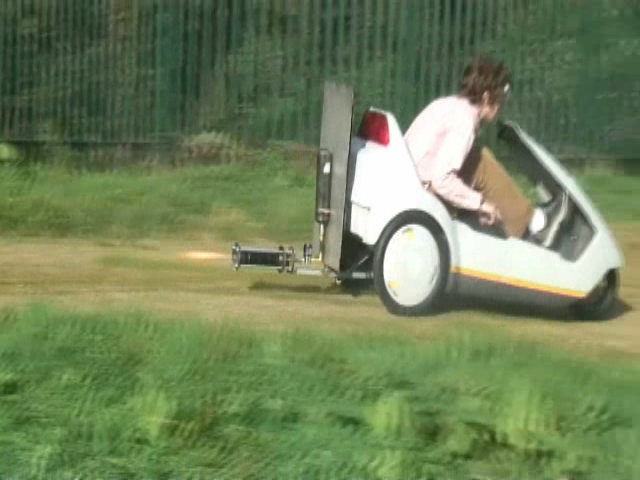 I believe we are the only people to have made controlled trust with actually edible food powered rockets, the only people to have propelled a human carrying vehicle with food powered rockets, the creators of the only rocket powered C5 (there is a jet one around(!)) and I very confident that we are the only people to have even tried fish and chips, let alone propelled anyone with it, as a rocket fuel. Though do mail me if you know otherwise!